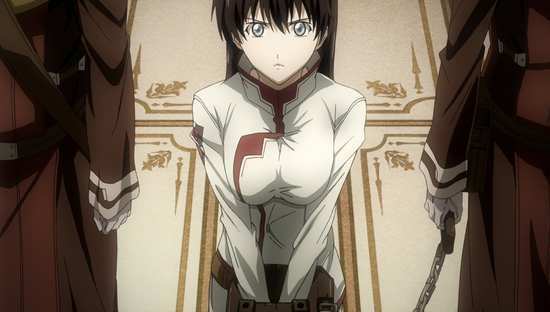 Broken Blade is MVM's first Blu-ray release, a little factoid that gives me a thrill just by typing it. During the past year, I've grown to really appreciate anime in high definition with lossless sound, where I was initially a little sceptical. 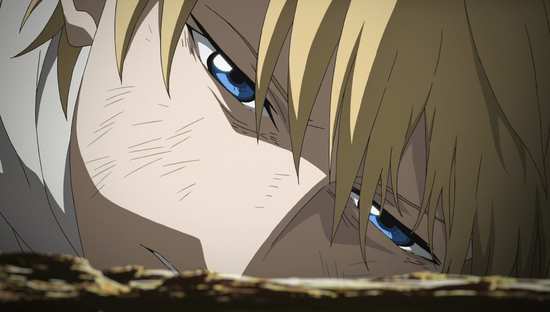 But selling anime in HD, especially to the UK's limited audience base has been a tricky proposition as Manga have found. After a faltering start, they've dialled back their ambitions a tad, in favour of distributing Kazé's HD releases, which sell to a pan-European customer-base. MVM on the other hand have found a third way. They're going halves with another Region B distributor, sharing inception and replication, which means that they won't have to find as many customers to make a profit. That other Region B distributor is Australia's Madman Entertainment, which is why you will find both company logos and age certification ratings on the discs. Of course Broken Blade may just be good enough to sell like hot cakes anyway, and it certainly has the pedigree to warrant a high definition release. 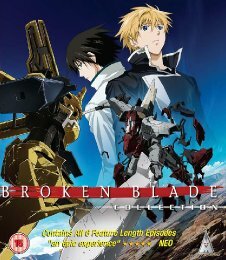 Broken Blade harks back to the nostalgic era of anime that got me hooked in the first place, when TV anime in the UK was scarce, and the good stuff used to come in the form of OVA series, episodes that were 45 minutes to an hour in length, with theatrical quality animation, and with no need to pander to television broadcast standards and limits. 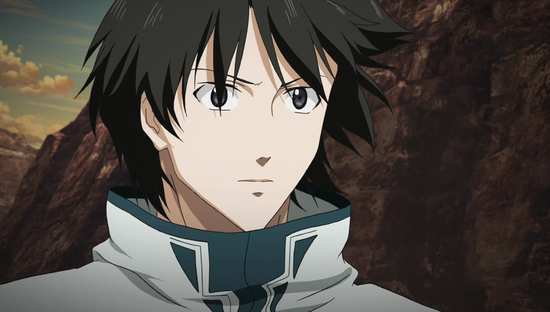 Broken Blade is a six episode OVA series, presented on two Blu-ray discs, with each episode running to just under an hour. It's another time, another world, where resources have grown scarce. But where there is no oil, energy, or metals, there is quartz, and there is magic. Magic in this case refers to the ability that most people are born with, the ability to control quartz, and imbue it with power. Quartz can be shaped into useful tools, and even vehicles, and people can control these devices. 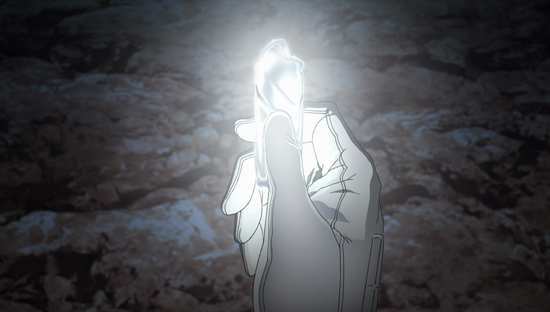 But there are rare individuals who are born without this ability, for whom quartz is merely a dead rock. These people are called un-sorcerers. Rygart Arrow is one such un-sorcerer, who tried to overcome his disability and attended a military academy. But when you can't empower the golems, the quartz robots that defend the various countries, there's only so far that you can advance. But when the nation of Krisna is attacked by neighbouring country of Athens, King Hodr calls on Rygart, his friend from the Academy for help. For even as the forces of Athens invade and drive forth to the capital, Krisna's scientists have uncovered an ancient device that they dub the Under-Golem. It's like no Golem ever seen before, controlled by mysterious devices and inscribed with ancient texts, and no one knows how to activate it. That's except for Rygart. For the Under-Golem responds to the Un-Sorcerer, and it appears that only Rygart can use it. This ancient piece of technology may be all that stands between Krisna's survival and utter defeat, for at the head of the invasion is King Hodr and Rygart's mutual friend from the Academy, Zess. I said that these were OVA episodes, but it's more accurate to describe them as mini-feature films. After all, they were initially released theatrically in Japan, and the Eirin logo marking them as such appears at the start of each episode. 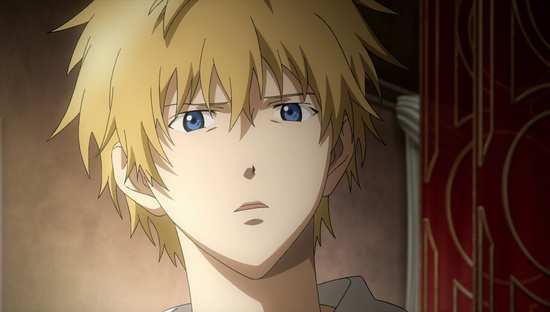 It's no surprise then that the animation is of genuine theatrical quality throughout, with a level of thought, detail, and production value that exceeds the normal television episode, and indeed normal OVA episodes. Therefore, the Blu-ray format is the ideal way in which to view this show, and these discs from MVM are a sheer joy to behold. The animation is presented in 1.78:1 widescreen at 1080p resolution, and every pixel is put to use bringing across the aforementioned detail in the show. The image is clear and sharp throughout, and the vivid and breathtaking colour palette can really only be appreciated in high definition. I noticed colour banding once in the whole show, otherwise it's an impeccable transfer, with no compression, no aliasing, and no indication at all that this isn't as the creators intended it to be seen. 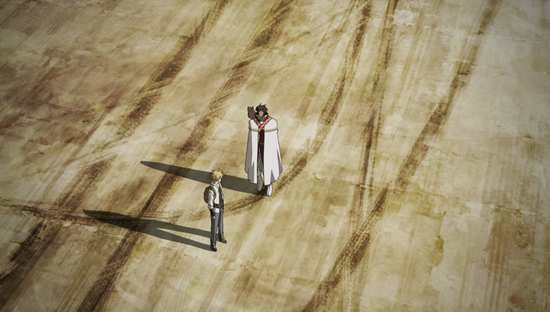 Broken Blade really stands out in terms of animation, artwork and world design. It's an interesting, almost post-apocalyptic future world that's presented, with idyllic cities and nations separated by barren wastelands. Rocks and canyons, parched deserts dominate, in which the futuristic cities are dotted like oases. The designs of these cities and civilisations has had a lot of thought put into them, and there is a very appealing look to the world, the vehicle and technology designs, and the costumes. The golems too stand out as marvellous designs, combining future technology with an almost mediaeval feel, to create armies of giant paladins striding into combat against each other. The only weak point is the main character mecha's super-armoured form, where it looks like a giant, demented chicken. 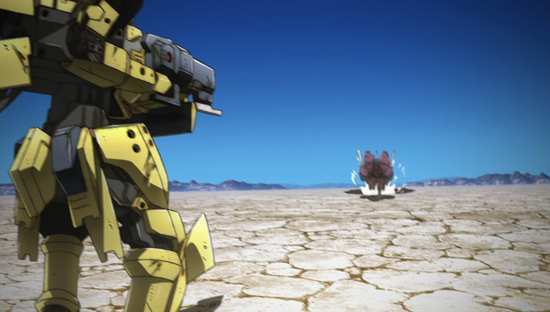 But the animation is strong and detailed throughout, the mecha combat sequences are inventive and brilliantly choreographed, and the quality and energy of the animation never dims for a single frame. 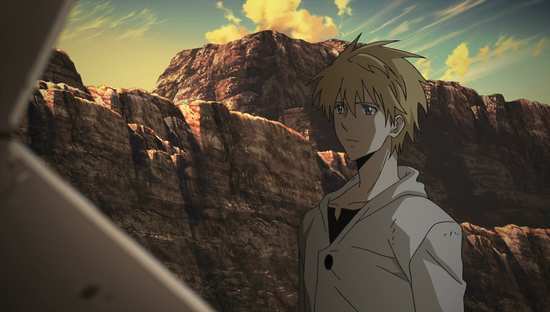 But above all, the most memorable images in Broken Blade are the skies. The richness and wealth of colour in the skies, the reds of sunsets, the harsh blues of midday, and the star filled wealth of night time all achieve a singular perfection on this Blu-ray. You have the choice between DTS-HD MA 5.1 Surround in English and Japanese, with optional translated subtitles and a signs only track. I went with the original language, and was more than happy with the actor performances. I sampled the English dub, and found it to be a tad less agreeable, especially in terms of the minor character performances. Incidentally, do you have neighbours? Well, better nudge that volume down a tad... a little further... a smidge more... hell, just knock it down halfway. Broken Blade's audio is thunderous. This is an action series that really delivers on the action. The giant mecha battling, the over-sized swords clashing, the cannons firing, the explosions, the wrecks, this will shake your room apart, with resounding LFE, and loud, dynamic and ear-drum wrecking audio. Yet, never is the clarity or dynamism sacrificed for bombast. The film's quieter scenes are just as clear, and just as accurately reproduced, delivering in subtlety what the action delivers in sonic bluster. Add to that a very agreeable music score, driving the action and the emotion well. 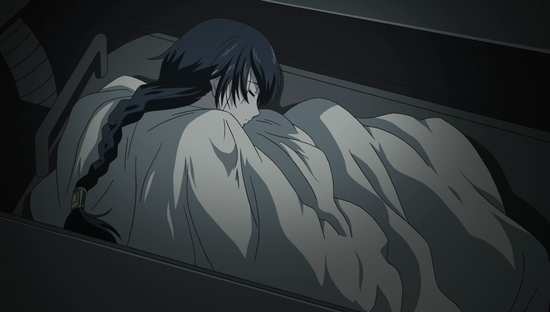 The episode's theme songs also suit the show well. I did notice one or two minor errors in the subtitles, and one head scratcher of what must be a mistranslation. Otherwise the subtitles were timed well and always legible, in a large yellow font. These are apparently the US Sentai discs, coded anew for Region B, and frontloaded with the local logos. Incidentally, the MVM logo looks sharp indeed in high definition, and I hope to see it again in that format many more times in the future. 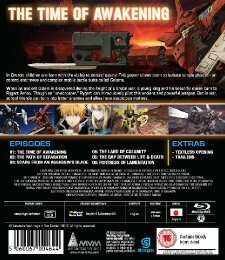 Disc 1 begins with a disclaimer that the extras may contain trailers for shows that aren't available through MVM and Madman. Sure enough, once you get past the static menu, you'll find that disc 1 contains trailers for Mardock Scramble, Infinite Stratos, Dream Eater Merry, and Loup=Garous. 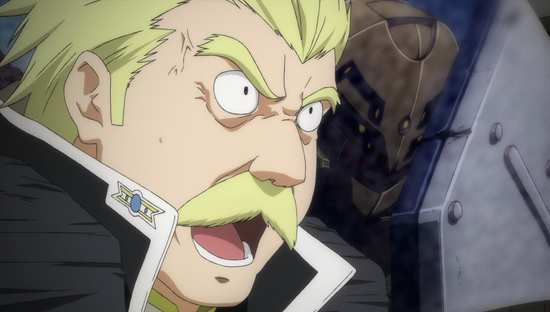 Dream Eater Merry is indeed a recent MVM acquisition, scheduled for 2013, and judging from its HD trailer, it makes me hope even more that Broken Blade is a Blu-ray success for MVM. The only extra on the disc though is the textless opening sequence to the films. Each episode does get a translated English credit reel following the end of the Japanese credits, silent, white text on a black background. If Michael Bay could make an anime... he'd probably make a Transformers movie, but I bet you that he'd have Broken Blade in his mind while he was making it. 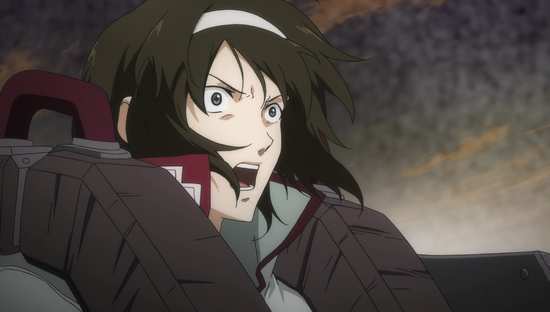 Broken Blade's six mini-movies are pure popcorn fluff, summer blockbusters in short form, jam packed with action, and with soundtracks loud enough to loosen teeth. The production values are consistently high, and these films are eye-candy so sweet that your eye-teeth will rot. It's a case of strapping yourself into your sofa to be taken on a wild and woolly rollercoaster ride through five hours plus of pure entertainment. And just like the average Michael Bay summer blockbuster, these aren't films that require the greatest of analysis, thought or consideration, and they don't necessarily make the best use of their story, or the characters. 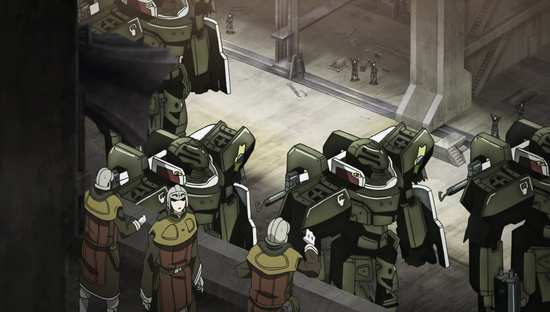 Of course, you are not supposed to care about this; you're supposed to get drunk on the spectacle of armies of giant quartz robots unleashing hell upon each other. In some ways, it's a good thing that there are six movies, and Broken Blade hasn't been reedited into one mega epic. I watched this at one episode per night, and could just about keep up. Any more than that, and I'm sure I'd wind up bleeding from the eyes and ears. It's one big mecha war movie, with a far future world having depleted its resources, and now reliant on magic empowered quartz. All machinery is powered by magic, and the golems that defend the various nations are built from quartz. Future technologists have great affinity to moulding crystal, but other technologies have become forgotten, especially as practically everyone has the ability to empower quartz. That's except for the hero, Rygart Arrow, a genetic throwback without an ounce of ability in him. When the war begins between Krisna and Athens, a war fought over the new resource of quartz, Krisna is completely outnumbered and outgunned, and so its King Hodr calls on his childhood friend Rygart to help defend the nation. They've discovered an ancient Golem that works off a wholly different power source. It refuses to respond to anyone who has the ability to empower quartz, but recognises Rygart when he pushes the starter button. This is a mecha made of metal of all things, is far stronger and more agile than any golem, but runs off some arcane power source, and has the tendency to overheat, requiring time offline to cool down. This ancient weapon may be all that can prevent defeat. And in true mecha anime fashion, Rygart is the only one who can pilot this mecha, and can do so without much practice, or reading the instruction manual. I did get an Orguss 02 vibe from this story element, but Broken Blade never really has the depth of that earlier OVA series. Yet there is more action than you could ever want with Broken Blade, and all of it is imaginatively designed and executed. It looks stupendous, and draws the viewer in with its inventiveness and pace. This being a war story, each episode builds up to a grand climactic battle and you stay glued to the screen as the balance shifts between both sides. You'll have noticed that I haven't really commented much on the story and the characters. That's because I never really got a good grip on them, and I suspect neither did Broken Blade's writers. In that regard, they were like cats playing with toys, fascinated as long as the toys held interest, and then dropped with sudden insolence once that interest had waned. Characters flit in and out of Broken Blade with whimsy. The writers set up enough back story, and develop the characters far enough for the viewer to register an interest, and then drop them out of the story, or worse just kill them off completely, leaving a hollow unfulfilled feeling in the viewer. When the show starts, you think that the focus will be on the childhood friends pitted against each other in the war, and there are plenty of flashbacks to indicate that the king and queen, Hodr and Sigyn, and their friends Zess and Rygart will drive the story. Rygart has a past with Sigyn that causes tension between him and Hodr that ought to threaten their friendship, while at the same time there is the obvious friendship turned to enmity between them and Zess. Except that Zess exits the story halfway through and doesn't play a part in its conclusion, while Rygart is soon on the front lines away from Hodr and Sigyn, limiting that storyline as well. Again and again, characters will be introduced, half-heartedly developed, and then will leave the story without satisfactory resolution. It's the same with the story itself, which will toy with plots and concepts, and discard them with little development. 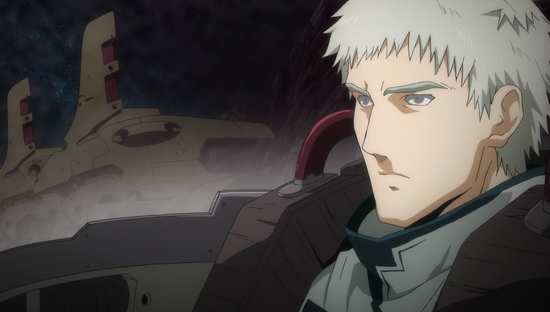 Just where does Rygart's mecha come from, why the war (we get glimpses of politics behind the scenes, but never enough), why the unreasonable surrender conditions offered to Hodr? The last is a question asked again and again in the story, not least by Zess, who looks as if he'll confront his brother (an Athenian politician) about it, but it's never answered. Why are the Athenian mecha pilots implied to be children in adult bodies? Aspects of the story, little character beats will be thrown in as almost random references, but with little to back them up, and always leaving the viewer wanting to know more. 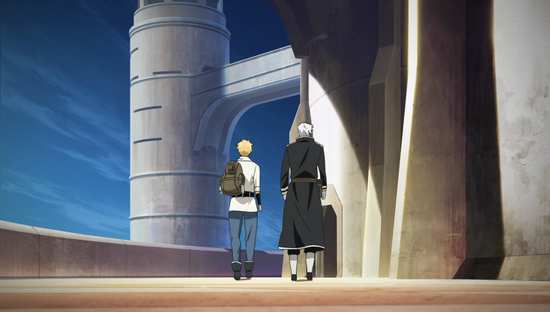 Broken Blade would have been a lot more interesting if it had the time to develop its back story and its characters, but then again, it would have been a 26 episode series with much lower production values. In every other respect, it's a very enjoyable series, one that gets the pacing just right, and the balance between action and drama, intensity and reflection is all spot on. The battles can be thunderous and adrenaline inducing, but these are leavened with quieter character moments, and little hints of comedy and lightness. One minute, two mecha pilots will be trying to slaughter each other, and the next minute, Queen Sigyn is trying to rehabilitate an enemy pilot by sharing her bed with her. Don't worry; it's not what you think it is, although the creators probably want you to think it is. 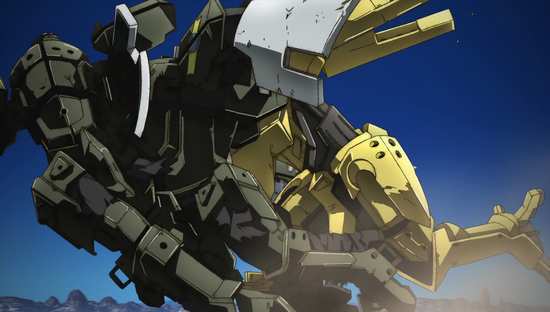 Broken Blade is pure style over substance, a mecha action show that is made for higher definition. In that regard, MVM couldn't have picked a better title to debut as their first Blu-ray release. But it's not deep, it's not smart, and it isn't going to get the critical juices flowing. It's an anime summer blockbuster, pure and simple, and you are going to have to check your brain at the door. Then again, take a look outside. Don't let that wet stuff fool you, it really is summer out there, and Broken Blade with a tub of popcorn is just what the anime doctor ordered.